Anne McAplin is the Packing Expert and author of Pack It Up: Travel Smart, Pack Light. Travel Expert Anne McAlpin has been a featured guest on Oprah®, The View, and CNN, sharing up-to-the-minute travel tips. She has flown more than 2 million miles, traveled in over 71 countries, and cruised through the Panama Canal 98 times. When her nieces and nephews turn 16, she gives them a passport and takes them on a trip anywhere they’d like to go. She is currently planning next summer’s adventure for her niece, Mary Beth: Africa. For Savvy Aunties that need an idea for day trips with their nieces and nephews, here’s one of my favorites: a (local) Wildlife Safari. Every summer, my nieces and I take an adventure to a new destination, and our #1 favorite by far has been a trip to Wildlife Safari – just a little more than an hours’ drive away. Our “safari” is a 600 acre drive-through animal park, located in Winston, Oregon. If you don’t have one near you, a local Zoo would be just as exciting. Getting up close and personal with animals large and small is a thrill to anyone of any age, especially children. 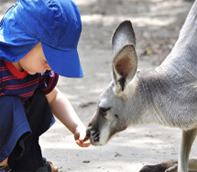 A great benefit is there is a lot to do at an animal park, so not much planning is needed – perfect for a first-time Savvy Auntie day trip. I have to admit that not having children of my own made our first trip was a little intimidating. Would it be fun? Would my nieces be bored? Would I be totally stressed out? Well, the answer is yes to it all, but with experience comes knowledge; and that’s all part of the fun! Schedule weeks in advance: Children’s schedules can be hectic, so check with parents for the best day, and get it on the calendar. Looking forward to a trip is almost as fun as taking the trip itself. Get everyone involved in the planning: Let them be in charge of the day (based on your suggestions). As kids, they aren’t in charge of much, so this is important. If you’re taking more than one niece or nephew, make sure there’s something for every age. Map your route: To help gain excitement, highlight your route on a map, and and “star” some stops along the way – a place that serves breakfast for your favorite smoothie and muffin, a rest-stop for some exercise, etc. Tape the map on the kitchen wall (we tape ours next to the bathroom sink, so everyone could look at it while brushing their teeth). Buy some picture post cards: Pick out some fun postcards, and write a quick “wish you were here” postcard. Include a favorite memory of the day, and then stamp and mail to their parents! Pack snacks and water in a cooler: Pack something healthy and something not so healthy! Plan something every 1-2 hours: A stop at a farmers market, playground, ice cream break, etc. should do it. Spending money: Before you leave home, give everyone some spending money for souvenirs ($5-$10 depending on budget). Some of the best times are spent in the souvenir shop. Always travel with a photo of your niece and nephew: Do this just in case someone wanders off! Pack a jump rope: This is a great way to burn off some energy at a rest stop. Most of all, remember that it’s about the gift of time. It’s amazing the memories I have from just hanging out and spending time with my nieces and nephews. And I’m happy to report that our 15+ years of day trips turned into a tradition of passports and international travel – with a much calmer and yes, Savvier Travel Auntie.